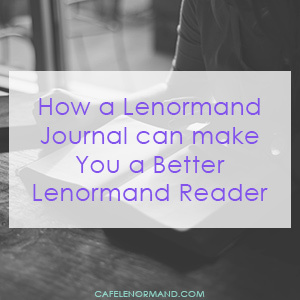 What can a Lenormand journal do for you? Imagine picking up a deck of Lenormand cards. You shuffle the cards and lay them out. You quickly know what the cards are telling you. You are confident you have the reading right. You tell your client sitting across from you what the cards have to say. They smile at you, impressed with your clarity and skill. Are you ready to learn what you need to make this come true for you? All you have to do is make a personal connection with the Lenormand cards, and you can do that by keeping a Lenormand journal. If you're like most readers, you probably want to know how to read Lenormand without having to refer to a book. To do this, you have to spend time getting to know the cards, learning how they speak and what they mean to you. I know it can be frighting to put the book away. It helps you when your mind goes blank, when you can't remember a meaning, or when you simply feel lost about what the cards are telling you. But referring to a book written by someone else only creates a relationship with that book, not with the cards themselves. If you are serious about mastering Lenormand, you need to keep a Lenormand journal. A Lenormand journal will speed up your Lenormand learning and help you develop new insights into how to work with the cards. Not to mention that once you become confident in your readings, it's a blast to go back to your early readings. Your journal is a great gauge of how far you have come, and it keeps you motivated to continue learning about your Lenormand cards. When you keep a Lenormand journal, you allow yourself to experience the cards in a way you'll never get from a book. You obtain a true hands-on feel for how the cards work, how they speak to you, and how they work together to create combinations and tell a story. You stop trying to memorize card meanings and combinations, and begin to unlock the language of Lenormand. It's this personal connection to the cards that allows you to know what a spread is telling you with just a glance. Wouldn't it be nice to read the cards so easily? As you record your readings in your Lenormand journal, you will begin to see patterns emerge. These patterns may include repeated card meanings, how the cards relate to specific situations, and how the cards speak to you personally. See how your readings can become much more accurate and insightful when you start to apply what you know instead of turning to a book every time? Your journal helps you to know what the cards say in every situation whereas a book can only tell you generalities. Imagine how such a simple tool as a journal can help you to impress your friends and family, and have clients flocking to your door as word spreads about how accurate your readings are. Your Lenormand journal helps you to record your experiences as you learn Lenormand…. And learning Lenormand is a never-ending story. Even after 7 years of studying Lenormand, I still gain new insights into the cards and how they speak. A journal allows you to keep notes of the things you learn. And, unless you have the memory of an elephant, your journal is a place you can record all of your spreads and readings. You can dive in deep and explore a reading in a way you may not be able to do with clients. Once a week, you can sit down and look at your readings. Notice if there is a continuing theme, if there are any connections to prior readings, or if it seems the cards are indicating changes that you can prepare for now. At any time, you can go through your journal and see how much you have learned. It's a big confidence boost to see how much your reading skills have improved and how accurate you are. What Will You Put in Your Lenormand Journal? It's time for you to start writing in your journal today. You can jot down a reading in a spiral-bound notebook or a simple diary. There are even journals designed specifically for Lenormand readings. I wish these had been available when I first started learning! It would have made it so much easier.